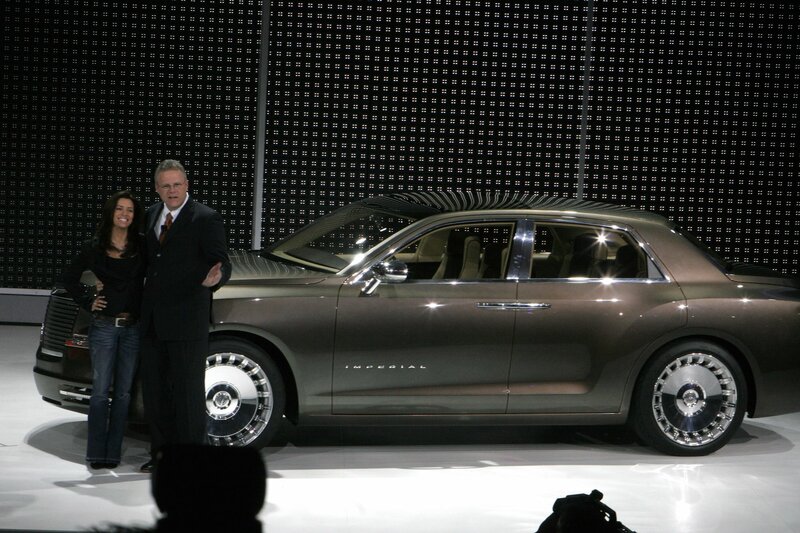 Like the great Imperials of Chrysler's storied past, the 2006 Imperial concept vehicle is designed as Chrysler's flagship, a luxury sedan that is elegant, provocative, aspirational, yet attainable. 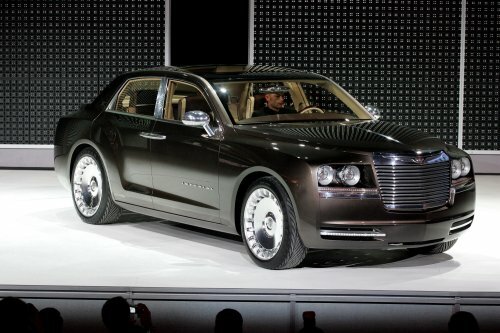 For inspiration, the designers looked not only to the classic Imperials of the 1930s and 1950s but also to Chrysler's long tradition of creative concept cars, from the earlier Chrysler d'Elegance and Falcon to the more recent Chrysler Chronos and Firepower. 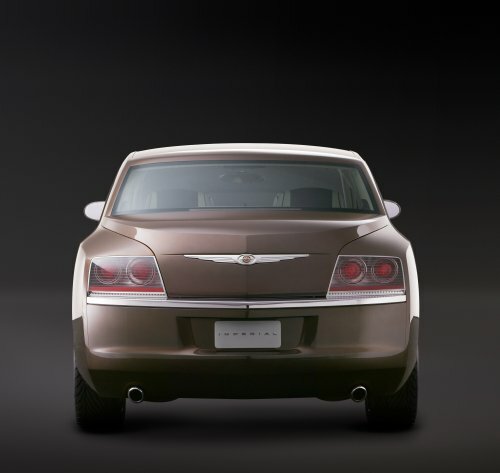 This rich heritage is expressed in the crisp line that parallels the sill, then arches up over the rear wheel and flows to the rear of the car, signaling that this is a powerful rear-drive automobile. 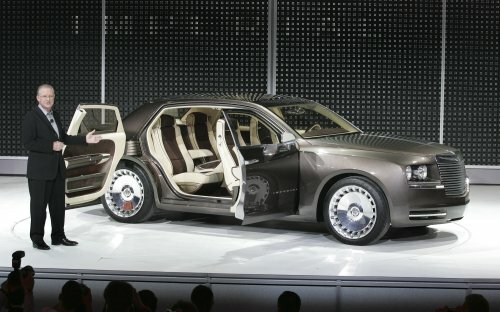 A similarly-shaped line rises up over the front wheel and flows rearward, falling slightly as in moves into the doors. 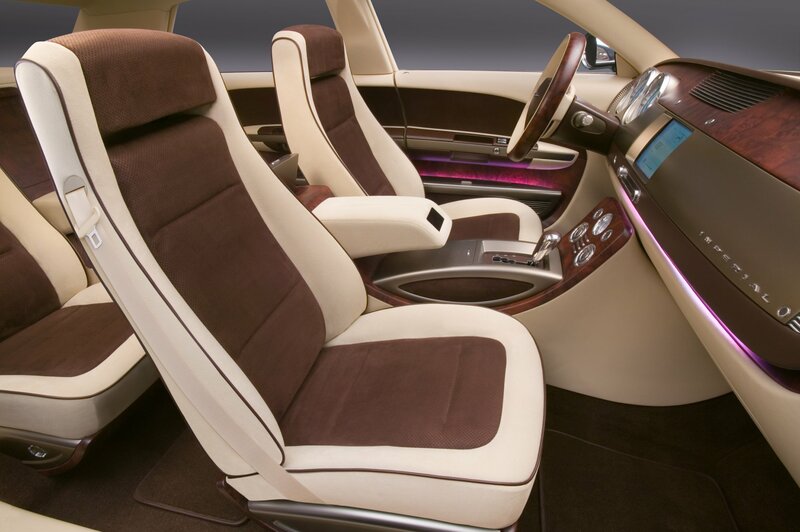 To fully realize the subtleties of the chaste body surfaces, every area was lovingly hand-sculpted in the hallowed tradition of the custom coachbuilt LeBaron bodies of the classic era. "The Imperial's exterior artfully blends a stately nobility, hand craftsmanship, and modern dynamic sculpture and proportion," says Mike Nicholas, principal exterior designer. 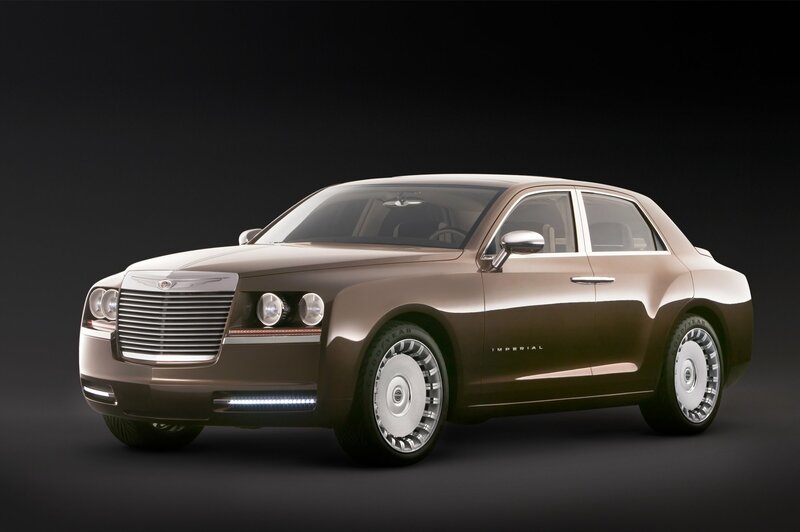 To realize the proportions the designers sought, the Imperial, mounted on a 123-inch wheelbase, is 17 inches longer and six inches higher than a 300 sedan. The roof was pulled rearward to enlarge the cabin as well as to create the luxury of length in side view. 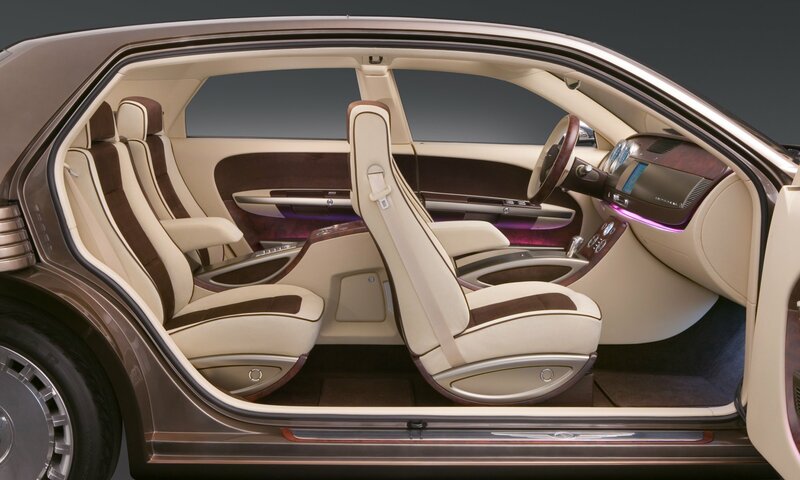 Most importantly, passengers sit nearly seven inches higher. Combined with the higher hood and deck and the large 22-inch aluminum wheels, this gives the Imperial the noble stance the designers envisioned. 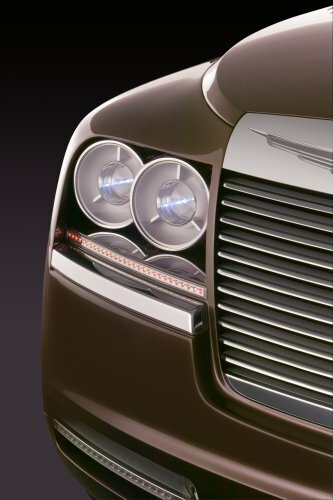 V-shaped in plan view, the front end is dominated by a central upright radiator grille which imparts a stately eminence previously unobtainable in all but the most expensive of imported motorcars. 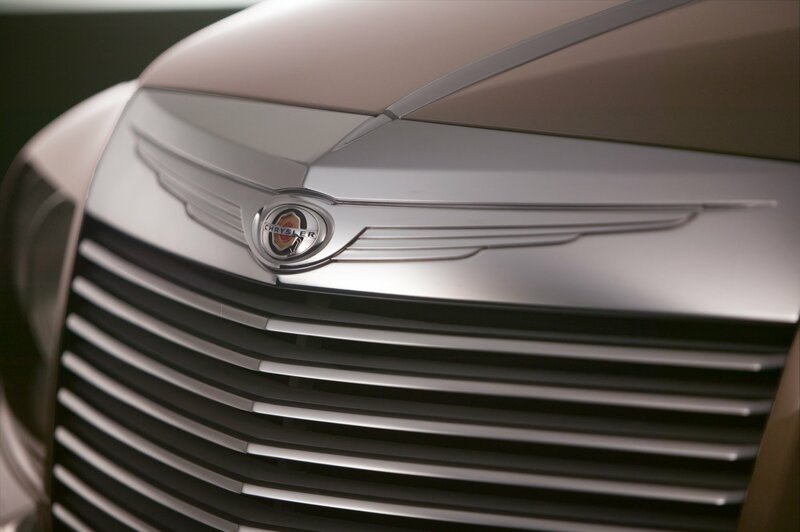 Composed of narrow chiseled linear elements of brushed and polished aluminum, the grille is capped by a bright header emblazoned with the Chrysler wings. 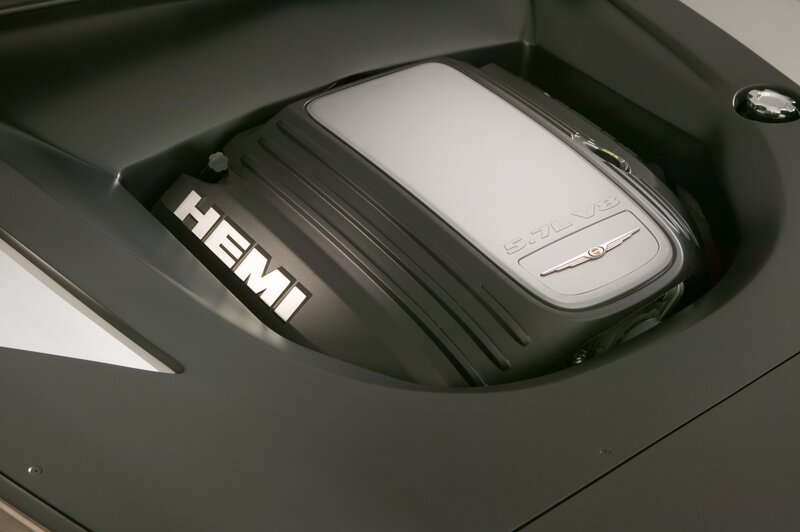 A polished molding, extending from the grille header to the base of the windshield, bisects the raised hood plane. Nested beneath browed cavities, the polished aluminum parabolic pods housing the projector-beam headlights reprise the individual free-standing headlamps of the Imperials of both the early thirties and the early sixties. 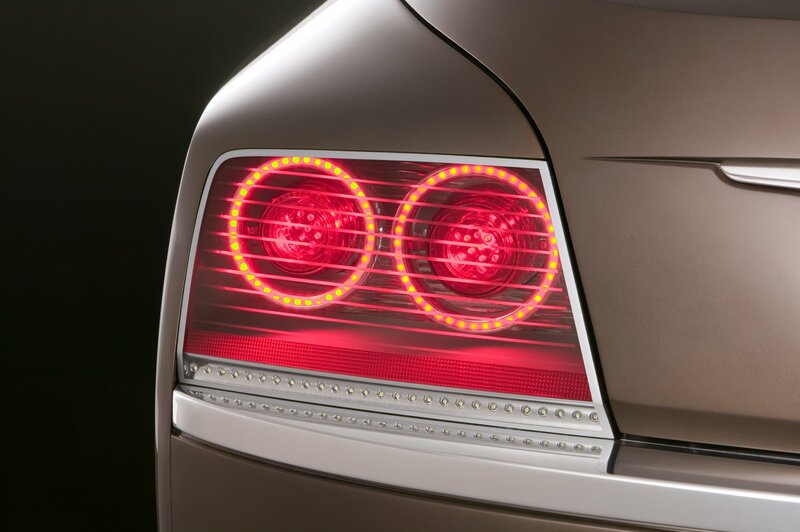 At the rear, the individual circular taillights with floating outer rings combine modern LED lighting with a look evocative of the signature "gun sight" taillights of previous Imperials. Separate slender LED lamp units provide for park, turn and back-up lamp functions. Complementing the hood, the raised deck lid is also V-shaped and accented by signature silver wings that unfold across its surface. 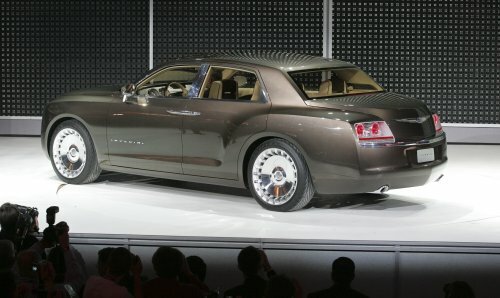 Body ornamentation is confined to the upper bumper bars, side view mirrors, side window reveals, and the handsomely-sculpted door handles. Hinged at the A and C-pillars, the wide doors can be flung open a la French doors for a dignified entry, revealing the absence of the customary B-pillar and permitting a dramatic realization of the entire interior. Attention to detail and materials is unsurpassed. 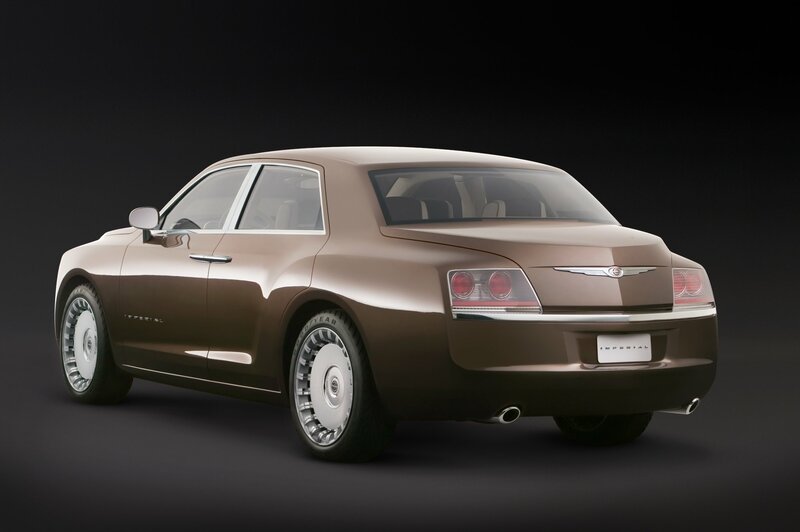 In studied contrast to the monochromatic Imperial Bronze exterior, the high-contrast four-passenger cabin is smartly two-toned in rich Bay Brown and buttery Birch Creme, inviting the viewer into a world of supple leather and soft suede complemented by California burl wood and metallic-like accents rendered in a lustrous warm bronze. The interior is characterized by the interplay of harmonious, expressively curving shapes in which the fuller forms of the instrument panel, door armrest and map pocket elements appear to "float" above sculpted recessed cavities. Even the seats seem to float above the floor. 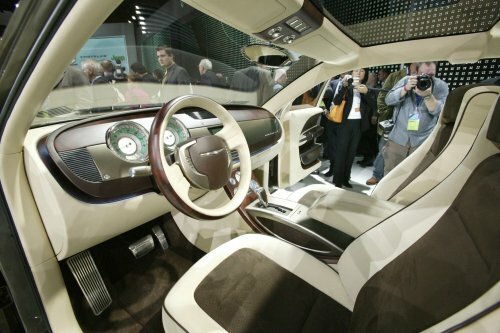 Their elliptically-curved bronze-and-burl side shields echo similar elements recessed into the full-length floor console. "We wanted everything inside to be nested, fitted and hand-crafted," says Nick Malachowski, principal interior designer, "with every component subtly reinforcing the hand-sculpted look of the exterior." 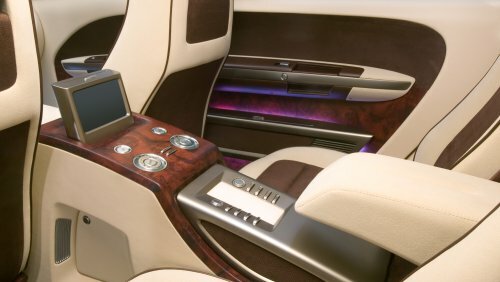 This is a driver's car, with a minimum of distracting gadgetry. A simple touch pad with intuitive controls, mounted close-by on the suspended center console armrest, permits the driver to adjust settings for radio, climate and navigation functions. The driver air bag/horn pad is fixed, allowing the radio and cruise-control switches to remain settled in the same position regardless of the turning steering wheel. 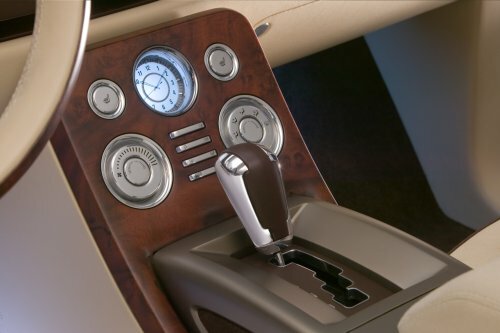 Boldly bisecting the uncluttered floating wood-and-bronze instrument panel are two large circular pods encircling sculpted gauges rendered in satin with polished aluminum bezels. Reminiscent of earlier Imperials, the exquisitely-detailed gauge faces are deliberately designed to satisfy the soul as well as inform the mind. Since the windshield glass is carried up onto the mid-point of the roof, front seat occupants enjoy a comprehensive view of the passing scene. All glass has a distinctive bronze tint to harmonize with the car's color palette. 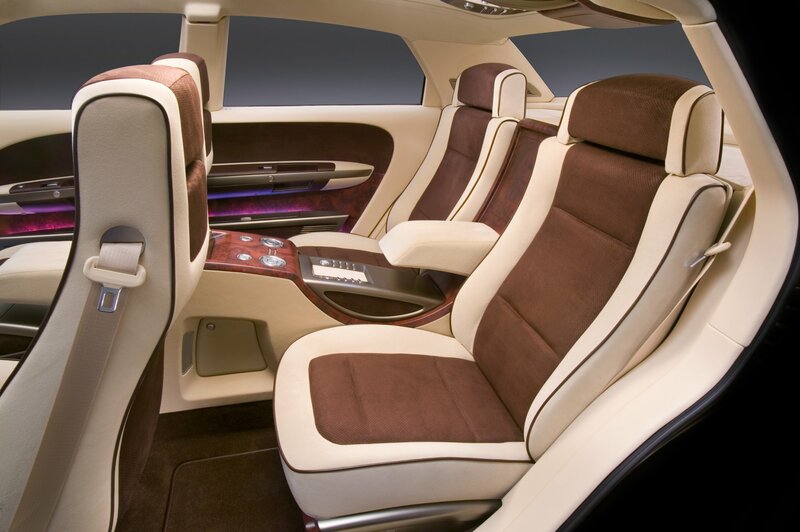 Rear passengers can recline their individual seats while watching different movies, thanks to the console-mounted dual-view entertainment screen and wireless headsets. The rear seat headsets store in the package tray at the touch of a button when not needed. Finally, there is the luxury of expressive illumination inspired by the artistry and elegance found in modern interior architecture. 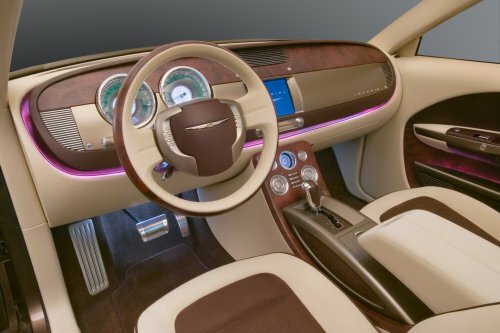 LED lighting, placed behind the "floating" elements of the instrument panel and doors, is used to enhance the sculptural elements of the interior. LED lights also provide indirect cove lighting for the headliner, which in addition offers the choice of electroluminescently-lit fabric or directed-beam spotlights located in the overhead console. 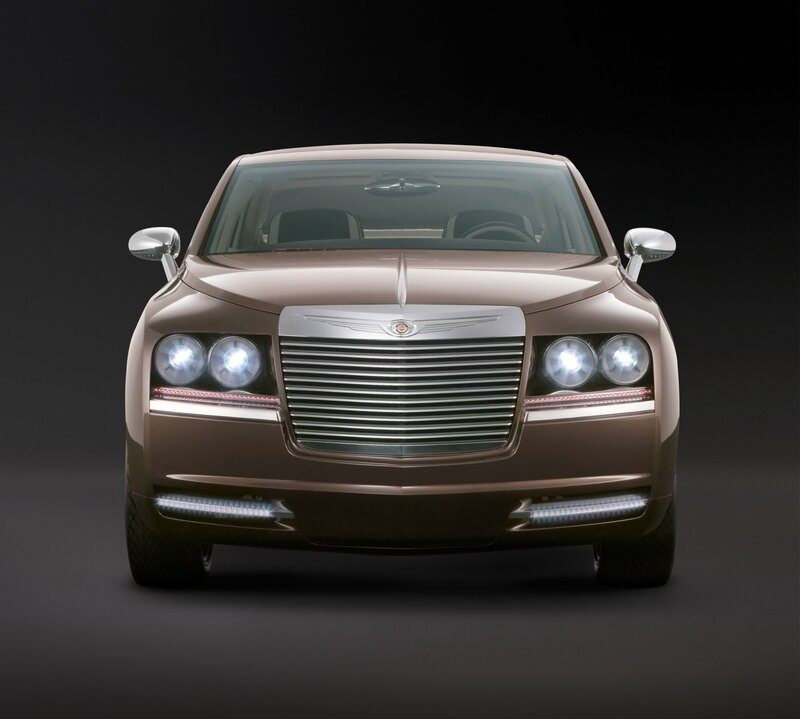 Drawing on the rich heritage of its memorable predecessors and endowed with modern dynamic proportions, this newest Imperial, crafted with a nobility of stance and purpose, is the finest expression of the Chrysler marque.